Holi is on the corner and it seems the sets of television serials are already getting drenched with colors. One such set where an early Holi is celebrated is Kasautii Zindagii Kay. The actors of the show are seen playing Holi with each other and desperately coloring the other while Erica Fernandes took over the responsibility of shooting the same. 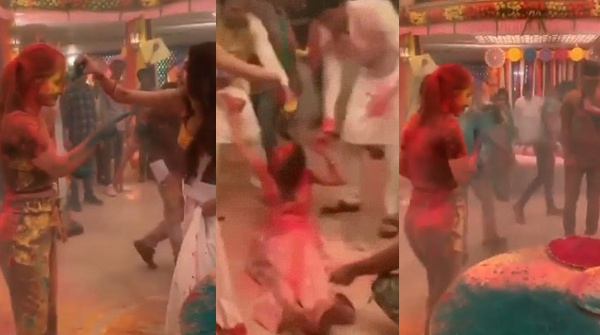 In a few videos, shared by the actress we can see Pooja Banerjee getting drenched with colors by Erica Fernandes, Parth Samthaan and Sahil Anand. Another video shows Hina Khan and Erica Fernandes applying color on each other. There had been reports earlier about the two actresses not being cordial with each other. And this video of the two literally clears the air about the same. The team spirit and the friendly environment among the stars on the set of Kasautii Zindagii Kay is inevitable through these videos. If you are a viewer of the show, you just can’t miss this fun! Check out the videos below and don’t forget to tell us if you think the same as we do. They had fun for sure!!! !